In order to meet the global commitments under the Paris Agreement and prevent harm to communities, action can be taken in local and regional communities. Adequately addressing climate change in cities and counties needs to include both mitigation strategies, preventing further climate change, and adaptation strategies, improving the ability communities to respond to climate threats. Support climate friendly transportation policy that aims to reduce emissions from the transportation section, regulates vehicle emissions standards, and increases funding for active transportation. Encourage elected officials to join with other policymakers in developing climate agendas or committees committed to moving climate action forward (ex. In U.S. Mayor’s NationalClimate Agenda or U.S. Climate Alliance). Have climate conversations with community members so they understand the health impacts of climate change. Ensure conduction of climate vulnerability assessments, which are assessments of potential climate risks and identification of necessary measures that are needed to decrease vulnerability to harm. Assist with completion of comprehensive climate action plans, detailed steps on how to reduce a state’s or communities contribution to climate change. Utilize CDC’s Building Resilience Against Climate Effects (BRACE) Framework in health departments. 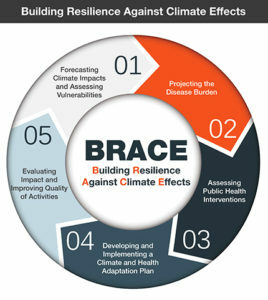 The following excerpt from the Florida Department of Health’s website shows how BRACE elements can be utilized: BRACE Program staff work with many partners within the DOH, other state agencies, climatologists, emergency managers, university researchers, non-profits, and planners who are developing and implementing climate adaptation plans and programs. The BRACE technical advisory group, a group that provides advice and input to the program, is composed of experts working at the state, regional, and local level across Florida. 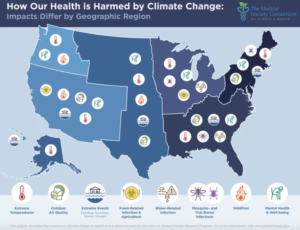 The Centers for Disease Control and Prevention (CDC) National Center for Environmental Health, Climate-Ready States and Cities Initiative supports the Florida BRACE Program. Nurses for Cool and Healthy Homes: A program developed by Angela Wan, RN and Valerie Tran, MPH, MUP at the Fresno County Public Health Department, that works to train nurses to assess climate risks during home visits. The program, ensures that all new home visit clients receive a home assessment with an emphasis on extreme heat safety, education on recommended resources, and a follow-up to see if the client was connected with services. The American Society of Landscape Architects website has a variety of resources on sustainable urban development. A report developed by Berkley Law and UCLA Law discusses challenges to sustainable development and identifies policy solutions to creating climate-friendly communities. The West Coast Climate and Materials Management Forum, a collaboration of state, local, and tribal governments that develop ways to institutionalize sustainable materials management practices, has a Climate Friendly Purchasing Toolkit to help all levels of government to reduce GHG emissions through their supply chain. A Planting Guide for climate resilient forests in Atlantic Canada. Cities and Climate Change: An Urgent Agenda discusses the link between climate change and cities, why cities should be concerned about climate change, and why cities should adopt preventative strategies. Maps and graphs of historical and projected climate trends for any county in the contiguous U.S.
Resources for how communities can respond to climate change. Recommendations for local government action across cities, towns, and counties. Outline of state development of Climate Action Plans across the U.S.